The Earth is a planet in the solar system. It is the third planet in distance from the sun; the previous two being Mercury and Venus. We live on a planet which is very unique in its own way. No other planet has been found where life can co-exist with a balance as just as that on earth. 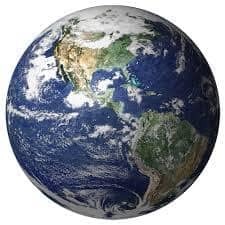 According to some investigation, it has been found out that this Earth was born around 4.5 billion years ago but some scientists do not back this fact. Our solar system has 4 rocky planets and 4 gaseous planets, so, Earth is a part of rocky planets. The Earth is made up of part land and part water. The mass present in the sun causes Earth and the other planets to revolve around it. More the mass, more the gravitational pull. Similarly, the earth’s only natural satellite, Moon revolves around the Earth due to the forces of attraction present between the Earth and the Moon. As long as scientists have found, they have concluded that Earth is the only planet where we can find water; thus making it extremely difficult for life to exist on other planets. Earth is made up of 71% water and 39% land. Because of the proportion of water present on Earth, it is also called ‘the blue planet’. The Earth has sustainable living conditions for humans. The rotation of Earth on its axis causes the change in day and night. Also at night, the moon is closer to the surface of Earth. This increases the gravitational forces of moon and we experience high tides at night due to this reason only. The revolution of earth around the sun causes a change in seasons. Earth may be a heavenly body but for all of us humans who live here, it is a survival pill. Without Earth no life is practically possible on earth. Our mother Earth is the one who gives life’s to all of us. Because of her creation, we live in a world where flora, fauna, human beings and other organisms coexist together in a sustainable, peaceful environment. The role of no organism in the working of this world can be undermined. We all coexist together to create a balance. It is a beautiful world we have been endowed with. And it is our duty to conserve it to the best for all we have; we owe it to the earth only. It is a responsibility, a promise to our own roots to do everything in our power to conserve the earth. We have practically no identity, had it not been for Mother Earth. All the resources we use come from Earth only in some or the other way. So practically we have a duty towards the Earth because our livelihood is dependable on Earth. Our water, clothes, food, shelter, technologically sophisticated machines (which have been built suing resources from Earth), the air we breathe, are all bounties of nature. Most of all, we should be thankful to have ever taken birth on this Earth and to have experienced the good things that the nature has in store for all of us. Be it the hustle bustle of cities or the serenity of hills, there is always something unique that Earth has got to offer to us. But recently, Earth has been facing a lot of issues. But the most heartening part is that it is due to the mindless, reckless activities of humans that our Earth is facing such issues. We have been mercilessly felling trees for our own benefits. To extract the benefits of trees, we do not see the harm that we cause to nature, deforestation of trees has become a major issue these days. The barks of the trees are used for their wood, to build houses and for many other purposes. Their leaves have medicinal properties which can heal wounds and many diseases. Thus, trees are cut for their various parts which are of utility to human beings. This causes an adverse effect on the environment. First of all, the roots of trees bind soil in their roots and their cutting off leaves the soil loose. This increases the chances of a landslide and the washing away of soil leads. Also, trees emit out oxygen. Without oxygen, life is practically impossible. Trees are needed to filter this poisonous air around us. These days, the pollution in the environment has reached new heights. Our environment is adversely polluted due to our actions- smoke from vehicles, air conditioners etc. this increases the content of carbon dioxide, carbon monoxide and other harmful gases in the air. These greenhouse gases trap more heat. This gives rise to the problem of global warming i.e. increasing the temperature of Earth. Humans should fear that day the nature decides to break the dam of its patience. Because then all hell will let loose and human will not be able to bear the wrath of nature. We have to realize that it is our earth to care for. Till we join our hands to ponder over this insipid condition of Earth, we will never be able to protect this Earth fully. If the world community is really keen to address this insipid problem. They all have to join their hands together and reach out to a conclusion as to how the situation can be tackled with. However, off late it is heartening to note that a few years back a world convention was held in Denmark which was participated by all the heads of their governments who have agreed through a treaty to reduce their carbon emission in a faced manner over a period of 20 years. This is one such movement in the history of mankind when the whole world community has come on a single platform to resolve the issue because the global warming and climatic change has affected them all. To start with we have to reduce our dependence on burning of fossil fuels. We have to search for alternative source of energy to run our machines and lighten our homes.